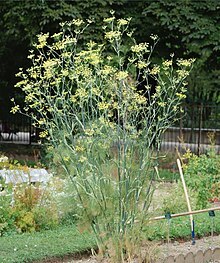 Finkle (Foeniculum vulgare) is a flouerin plant species in the carrot faimily. ↑ The Plant List, Foeniculum vulgare Mill. ↑ "Classification for Kingdom Plantae Down to Genus Foeniculum Mill.". US Department of Agriculture, Natural Resources Conservation Service. 2015. Retrieved 24 March 2015. This page wis last eeditit on 4 Apryle 2017, at 19:07.